Elderberry is the fruit of the elder tree, and as a supplement it is often used for colds and flu. Why do people take elderberry? Elderberries contain natural substances called flavonoids. They seem to help reduce swelling, fight inflammation, and boost the immune system. 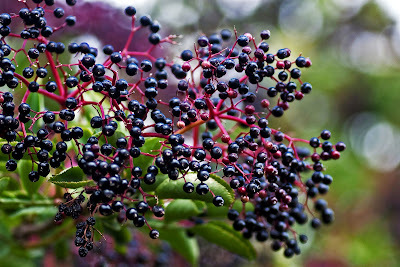 Studies have found that elderberry eases flu symptoms like fever, headache, sore throat, fatigue, cough, and body ache. The benefits seem to be greatest when started within 24 to 48 hours after the symptoms begin. One study found that elderberry could cut the duration of flu symptoms by more than 50%. Lab studies have found that elderberry might be effective against H1N1, or swine flu. A few studies have suggested that elderberry could help with bacterial sinus infections or bronchitis. More research needs to be done. People use elderberry for high cholesterol, HIV, and many other conditions. That is what brings me to this post. After buying for a year I wanted to attempt to make it myself. We use elderberry to help us stay healthy during cold and flu season. If one of us start to feel ill I will up the daily dose from once a day to three times a day and my immune system really kicks into overdrive. Again, I know exactly what is going in. Make sure you buy your honey local for added benefits. Why local? Taking a high-quality raw local honey for two months before allergy season can actually lessen your allergies. Bees carry the pollen that aggravates seasonal allergies, and some of that pollen becomes part of the honey. Consuming honey daily before allergy season can help your body grow accustomed to the pollen and immunize your body against it. Thinly slice ginger and add to pot. Last add water and bring to a boil. Lower to a simmer for 1 hour. Cover pot with cracked lid. I prop a wooden spoon under one side of my lid. After one hour remove from heat and let steep for a bit. It will become a wonderful deep purple. I let mine sit for about 15 minutes. Last run through a strainer to remove the solid ingredients. With a candy thermometer allow to cool to 110 degrees. Next add honey and stir until fully dissolved. We all take this daily. When someone starts getting a sickness we will double and triple up on the dose. I have had a lot of people that are interested in purchasing the Elderberry instead of making it themselves. If you are interested in buying it directly from me please feel free to email me a tsambeau@yahoo.com.